The title speaks the truth: so far, so good. The man's been a staple in the music business since the 1970s, and has earned himself Canadian rock legend status by way of countless hits, especially since he decided to begin a solo career in the late 1970s. Releasing a total of six albums (plus one live album) between 1980 and 1991, he proved to be a rock powerhouse with hits such as "Summer of '69", "(Everything I Do) I Do It For You", and the always popular "Heaven", which was his first #1 hit, as well as the song later popularized in dance form by DJ Sammy & Yanou in 2002 as one of the most popular "pop-trance" tunes ever released. But in 1993, it was time for the inevitable: a greatest hits collection. 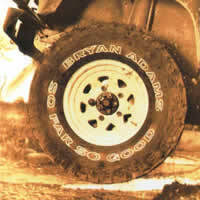 "So Far So Good" is that very album, and contains the most popular of Bryan Adams' previous hits (although unusually absent from this collection are any songs from Adams' first two albums), plus two new songs, one of them becoming a hit on its own. Much of Bryan Adams' repertoire has a rough pop-rock edge to it, occasionally teetering on the border of sounding like a pure 80s rock release. The collective work starts with Summer of '69, one of his bigger hits from the 80s, which gives us a good look at what to expect from the rest of the album, quality-wise. The song itself is one of his more upbeat numbers here, which is contrasted greatly by the more ballad-oriented Straight From the Heart. It is interesting to note that Adams' normally gravelly voice is subdued and more fluid in ballad form. The connection to 80s hair-band rock is even more evident with It's Only Love, as it has all the elements necessary -- wild electric guitar work, snare drums with classic reverb, and all the shout-singing you need. Plus it features Tina Turner, so how could this track possibly go wrong? This is followed by Can't Stop This Thing We Started, one of the more recent singles from this now-outdated compilation, which feels more like a mix between the standard rock Adams has been known for, a little bit of "new wave", and even a little hint of country bumpkinism! For me, it is probably one of the most memorable songs on this album, as it was played many a time during my childhood. ...until you get to Heaven, which shines as one of the great highlights of the album. Before it was re-created for the world to 'break it down' to in 2002 by DJ Sammy & Yanou featuring Do, "Heaven" was just this cool, honest ballad released in 1985 as a single. It was Adams' first #1 on the U.S. Billboard Hot 100 chart, showcasing (and re-inforcing) his ability to write quality rock ballads. This is succeeded by Cuts Like A Knife, another of Adams' famous mid-80s rock tunes that earned him fame. Again, it serves its purpose as standard pop-rock for its time. But perhaps his strength lies more in his ballads, as is proven by (Everything I Do) I Do It For You, which is definitely his most popular song from this compilation. It's also the longest track here, clocking in at just over six and a half minutes. Initially written for the movie "Robin Hood: Prince of Thieves", it gained worldwide fame, especially in Canada where it was #1 for a surprising 39 weeks, and in the U.K. for 16 weeks. It is indeed a strong slow song, certainly good for easy listening by the fireplace or slow dancing at the prom. Somebody also sounds like it could come from an 80s hair band, which is a solid indication of the sound you can expect from this tune. After this is Kids Wanna Rock, a new song made especially for this album. Definitely one of the most rockin' tunes available here, the vocals are as loud and proud as ever; this song feels like a reflection of something Don Henley might have released in his solo heyday. Full of energy and spirit, this is Adams at his greatest. Heat of the Night seems to also scream the influence of Don Henley (I suppose this entire album sounds like the love child of any two solo Henley albums), but there doesn't seem to be any distinguishing features in this song that we haven't heard already. The last track is Please Forgive Me, the second new song for the album, and subsequently the only new single as well. It is also another slow song with a slight country edge. Nothing is particularly catchy here but the song is heartfelt enough to be passable and meets the quality standards of Bryan Adams' usual fare. Although Bryan Adams normally doesn't pop up frequently in my listening library (except in a couple of funky cases), "So Far So Good" is sure to please the rock-loving masses. Admittedly, many of the songs tend to have a common sound, thus causing some boredom during the listening process (at least for me). Nevertheless, as a pinnacle of mainstream rock music, Bryan Adams is sure to please fans past and present with this amassing of classic hits. You may likely prefer one of his more recent greatest hits compilations, such as "Anthology", which covers hits from the late 1970s to 2005. But in the end, it's up to you whether you are a big enough fan to snag it and enjoy it.